I tracked my Karabella Soft Tweed from the Flying Fingers Yarn Shop and it's not due to arrive until March 6. So, as I wait for that package, I decided to start this tweedy vest project from Knitscene. However, the yarn I'm using is not so tweedy. It's the Rowan Kid Soft from the sweater I unraveled last week. The hanks were finally dry a couple of days ago, so I rewound the yarn into balls and swatched last night. This pattern has an eight-row repeated ribbing that creates wavy ribs you can't really detect in the photo. 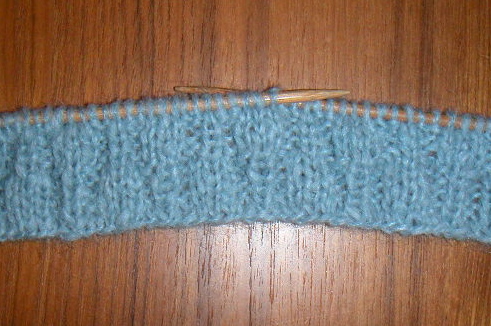 In fact, when I first started knitting I thought the pattern was wrong. I think the Kid Soft will show off the waves nicely!